Ken Hurlburt was born in Lethbridge, Alberta in 1928 to Hannah and Orval Hurlburt and grew up during the depression in Milk River. No stranger to hard work, he was picking up odd jobs as early as seven years old, not for spending money, but to help his family get by. Through his teenage years, you could find him completely engaged and working wherever and whenever he could at the local stockyards. The seed for his life’s work was planted. After a year working with a crew surveying the Mackenzie Highway in the North West Territories, Ken headed back to Lethbridge hoping to pick up the cattle business where he left off. In the forties, the concept of selling livestock by auction was gaining popularity and the drovers’ era of private sales was coming to an end. Ken and a partner formed their own cattle buying company, bought an old truck and worked the country, buying one cow at a time. It was about this time, on a blind date arranged by her brother, (auctioneer Ted Newby) that Ken met a dark haired beauty named ReNée Newby, daughter of auctioneer Jack Newby and his wife Cora. Ken loved to say “I met her on the 25th of May, we were engaged on the 25th of June and married on the 5th of September. I knew she was perfect.” This September would have marked Ken and ReNée’s 67th wedding anniversary. In 1952 foot and mouth disease struck, and the cattle industry was in crisis. Determined, Ken set his sights on a new career, and with a $500 loan, a wife and two babies, he enrolled in auction school at Western College of Auctioneering in Billings, Montana. He was honoured to become the first Canadian appointed to the teaching staff of that college. Ken and ReNée settled in Lethbridge where their family grew to include six children: Jody (Ted Thaell), Brant (Patty), Darcee (Bruce Robertson), Kim (Kim Tillsley), Thane (Joy) and Heath (Dallas). Word of Ken’s talent spread quickly. He sold for Calgary Public Stockyards Mondays through Thursdays, for Pincher Creek Community Auctions on Fridays and Medicine Hat and Walsh on Saturdays. He was asked to consult with the St. Boniface, Manitoba Stockyards which at that time, was the largest livestock sales yard in the British Commonwealth. They operated six concurrent sales rings and to help turn their new but struggling auction facilities around, Ken commuted by train from Alberta for two years. Ken pioneered the concept of selling land by auction in Alberta; over 50 years ago he sold 26 sections of land near Foremost by auction. He sold such prestigious sales as the Royal Winter Fair in Toronto from 1958-1961, North America’s Largest Bull Sale in Calgary, and the Pacific National Exhibition in Vancouver where he sold the record high priced Angus bull at $10,000 for E.P. Taylor. Along with partners, Ken opened Fort Macleod Auction Market Ltd. in 1960, the Highwood Livestock Auction in High River in 1984 and Pincher Creek and Cranbrook Auction Markets in 1993. 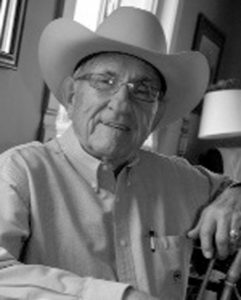 He served as President of the Fort Macleod Rodeo Association from 1960-1966, President of Alberta Auction Markets from 1963-1965, served on the Livestock Marketing (International) Association for three terms, was a Calgary Stampede Lifetime Alumnus, and judged both the World Auctioneers’ and the Calgary Stampede Auctioneers’ Championships. Ken was mayor of Fort Macleod for four years, and was twice elected Progressive Conservative Member of Parliament from 1972-1979. He was named Honorary Chief Ermine Horn of the Piikani Nation’s Black Horse Society. In 2012, Ken was inducted into the Livestock Marketing Association of Canada’s Hall of Fame. He was also the proud recipient of numerous medals for outstanding community service for ‘people whose actions have benefited their fellow Canadians’: 1967 Alberta Achievement Award 1974 RCMP Scroll 1977 Queen’s 25th Anniversary Medal 1992 Commemorative Medal 125th Anniversary of the Confederation of Canada, 2005 Alberta Centennial Medal 2003 Queen’s Golden Jubilee Medal 2012 Queen’s Diamond Jubilee Medal Ken and ReNée moved their family to Fort Macleod in the sixties – the home of the family ranch – where he was always humbled by where their hard work and devotion had brought them. He was a very grateful man; always singling out ReNée, awed by her steadfastness and faith in him. Ken Hurlburt was one of those people who made a difference – to his family, to his profession and to his country. He was highly skilled at what he did; he had a great affection for people, an engaging sense of humour and an infectious laugh. His diplomatic and marketing skills were exemplary. He was a visionary; dedicated and determined. He had a legendary work ethic and his accomplishments are rivalled only by the incredible volume of loving memories held forever in the hearts of his six children, their husbands and wives, twenty grandchildren, their husbands and wives and twenty-seven great grandchildren. Ken was predeceased by his older brother Tom Hurlburt of Sacramento, California and is also survived by his twin sister Kathryn Hurlburt of Fort Macleod. A memorial service will be held at Trinity United Church, 220 – 20 Street, Fort Macleod, Alberta on Monday July 25, at 2:00 pm, with a reception to follow at the Fort Macleod Auction Market, 813 – 14 Street, Fort Macleod, Alberta. Condolences may be forwarded to leslie@hurlburtrock.com The Hurlburt Family would like to express their great appreciation to Dr. Steven Beekman for his gentle and compassionate approach to Ken’s care. They also extend a warm thank you to the staff at Fort Macleod Extendicare whose daily kindnesses were always noticed and made every day just a little brighter. Memorials in Ken’s name shall be gratefully accepted by the Fort Macleod HandiBus Society, PO Box 881, Fort Macleod, Alberta T0L 0Z0, or a charity of your choice. Our thoughts and prayers are with you during this difficult time. May wonderful memories bring you peace. Doris, Barb, Jackie, Cam, Sharon, Tracy and their families.